Among late signs like sclerosis, cysts and osteophytes, alteration of cartilage is a common problem in osteoarthritis. To detect abnormal states in the glenohumeral joint, the physiologic distribution of the cartilage thickness must be known, which will allow physicians to better advise patients. High-resolution computed tomography (CT) data in soft tissue kernel provide highly accurate quantitative results and are a useful method to determine the geometrical situation of the glenohumeral joint. 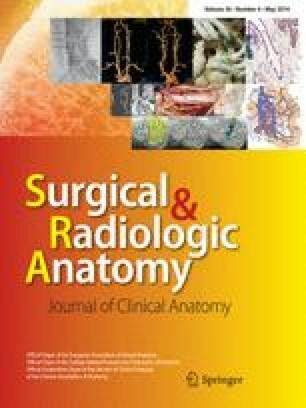 The objective of this study was to characterize the distribution of the thickness of the glenohumeral joint cartilage using CT.
To investigate the distribution of thickness of the joint cartilage, CT images in soft tissue kernel of nine specimens were analyzed using image visualization software. Statistical analysis of the obtained data was performed using the ANOVA test. Results showed different patterns in the glenoid cavity than in humeral head. Cartilage thickness in all glenoids showed maxima in the inferior and anterior portion, whereas central areas are covered with the thinnest cartilage layer. Maximum cartilage thickness in the humeral head was found in the central and superior parts. We could show that the distribution of cartilage thickness in the glenohumeral joint is not homogenous and that there exist several reproducible patterns. Evaluation of cartilage thickness in the glenohumeral joint is of high interest in basic and clinical research. V. Zumstein and M. Kraljević contributed equally to this work. The authors declare that they have no financial and personal relationships with other people or organizations that could inappropriately influence their work.